If you’re in a situation where you want to (or have to) sell your car but it hasn’t been paid off yet (there’s a loan / there’s a lien / the title isn’t clear / it’s financed), then there are some things you should know in order to have a successful sale. Can I Sell a Financed Car? First of all, yes – you can privately sell a car that is still financed. You can sell it yourself or trade it in at a dealer but you’ll get more for the vehicle when you sell it yourself (that’s sort of the point of this whole website – helping you sell your car quickly and get the most for it by doing it yourself). The main thing you need to know is that you have to call your bank (or wherever it’s financed) and ask for the payoff amount. This is the amount you would have to pay in order to get rid of the loan and have the car just in your name. Along with that, you’ll need to notify anyone coming to see the vehicle that the title is not clear and that there’s still a loan on the car. Be sure to tell them that you know the payoff amount. They’ll ask what that is and it’s fine to tell them. It just can’t be for more than you’re asking – you’d essentially be “underwater” with your vehicle loan-wise if this is the case. Being underwater with your car loan means you owe more on the car than it’s worth. This is a problem if you want to sell the car. Your best option here is to wait or find the money to pay down the loan more so that you’re not underwater with it. You should ask yourself if you really need to get a different car or if you can wait. I was in this situation once – I traded in a car that I owed money on and got a new car. The dealer and bank then rolled what I owed on the old car into the new loan. I look back and don’t know why they did that. It seems that today, banks would be less likely to do that. 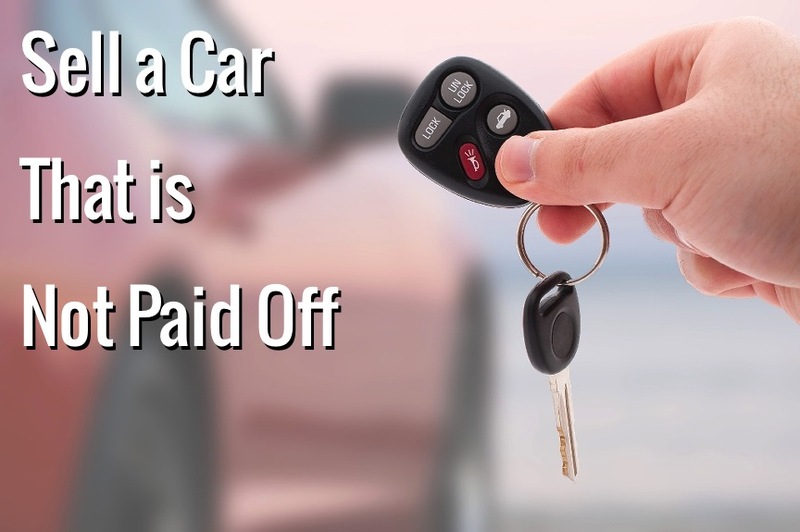 One option is to try to sell the car, get the most you can for it and then take out a personal loan or home equity loan to cover the difference. You might even be able to take a loan out on your 401k or retirement plan but that’s not a good idea and it should be avoided if possible. One more option might be to get a different loan on the vehicle if you have good credit. Maybe you can get a lower interest rate or extend the payments over another year or so and then you’d have a lower monthly payment. Often, these loans don’t take effect for 45 days, so you’d also be able to skip a payment, which might also help you. Let’s go through the complete process on how to sell a car that is not paid off so that you do it right and don’t run into problems. Know that you’ll have to do a little bit of extra work but if you really want to sell the car, you probably can. One important thing is to make sure potential buyers that come by to look at the car feel comfortable. If they ask you what you owe or what the payoff is and you don’t even know, they’ll probably leave. Call your lender and find out what the payoff is. They’ll tell you how long that amount is good for. It might be a week or 15 days or 30 days. Find out how much your car is worth and then price it properly. Clean your vehicle and get it ready to sell. Take good pictures, write up good ads and get the word out (online and offline). Make sure you have all the necessary paperwork ready for when people show up. You’ll need the title (with the lien note on it), a bill of sale document and any other paperwork that the Department of Motor Vehicles (DMV) in your state requires (smog test, etc.). When you have agreed on a price with a buyer, you’ll need to get the title in their name. To do that, you will first have to go to your lender (bank) with your check or cash from the buyer and then have the loan paid off. The complicated thing here is that if you have a personal check, the bank might want to wait for the check to clear and this will delay things. If possible, get cash or a bank check. The bank check can be made out to you or your bank. Your lender might be able to give you a lien release right then or it might take a few days. When you get it, you’ll need to go to your state’s Department of Motor Vehicles and get a clean title that does not show a lien on the vehicle. Once you have that, you can sign the vehicle’s title over to the new owner, like normal. The buyer might want to go to the bank with you. If this is the case, then that’s fine. Plan a time where you can both do it together. Maybe call your bank ahead of time and ask what the best time is to do that and who you should talk to – just to ensure that everything goes smoothly. If you get in there during their busiest time, you’ll have to wait and let’s face it, that’s just awkward being there with someone you don’t know. Probably the worst thing you can do is not tell the buyer that the vehicle isn’t paid off. If you take their money and then tell them that you have to first go to your bank, they might not be happy. Be honest and tell them. Know that it is possible to sell a vehicle that is not paid off. It’s more work but it can be done. Your best bet is to find a way to first pay it off so that you don’t have to deal with all this extra work. You’ll also attract more buyers when the car title is clear as they know they won’t have to also work a little more to get the vehicle – it’s just a lot cleaner and easier this way. Do everything you can to make the sale hassle free. Think of what questions someone might ask about the loan and have answers ready. Get the payoff and talk to your bank and see if they’ll work with you on your loan – just let them know what situation you’re in and they might even have some ideas that you haven’t thought of. Thanks for stopping by the website and reading this article. If you have comments that might help someone, please leave them below. Please do share this article with others you know if you think this article is valuable and would help them. This entry was posted in Car Selling Tips and tagged bill of sale document, car selling help, Car Selling Tips, how to sell a car, how to sell a car that isn't paid off, how to sell a financed car privately, owe more on car than it's worth, underwater with car loan, upside down car loan, upside down car loan options by TC. Bookmark the permalink.